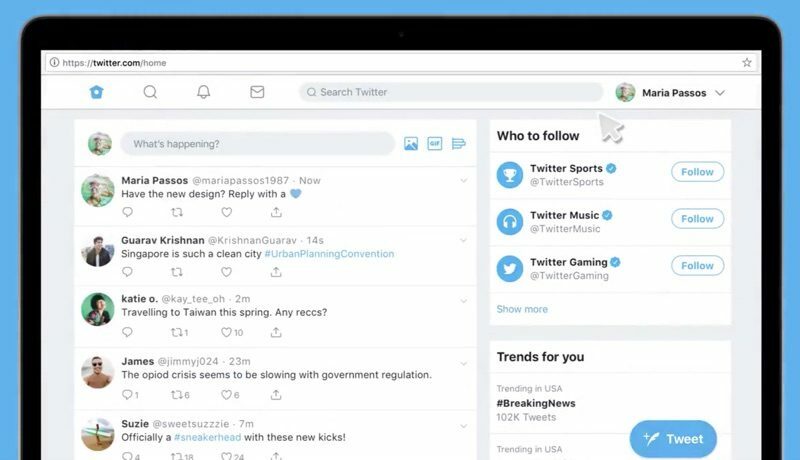 Twitter today announced that it has started rolling out a new, simplified interface on the web, which is available to some users starting today. The updated interface features a two-column design instead of the current three-column layout, and there are a number of new features aimed at making it easier to use Twitter on the web. Twitter is gaining an emoji button, quick keyboard shortcuts, an upgraded trends feature, an advanced search interface, and more. According to Twitter, some users are seeing an opt-in option to give the new interface a try as of today, while others will need to wait to see the new design. Those who do not prefer the updated look can opt out. Twitter is also working on an updated Dark Mode feature, according to Twitter CEO Jack Dorsey. In a reply to a Twitter user complaining about the current Dark Mode interface, which is more of a dark blue than black, Dorsey said Twitter is planning to fix it with true black color in the future. There's no word on when Twitter plans to introduce the updated dark mode, but those unhappy with the current version will be glad to know an update is coming. I just wish that they'd bring back the Mac app. Pure black is gross. The dark blue that twitter has now is one of the most appealing features of the app. That @#^$*@#$!! android compose button is why I'm using Tweetbot again. Twitter seem to be scrabbling around for something to do. Where is the innovation? I really like the current dark/night mode - it’s actually less ‘harsh’ than true black. This! Exactly this! That's precisely what I wanted to convey but I couldn't find the words at the time. Best thing Twitter could do is add a 3-option choice (light/dark grey/black) along the lines of how Things does it on macOS & iOS - and keep the current dark mode colour theme as the middle option. That way, everyone would be happy. Oh, and yeah - bring back the Mac app! The official Tweetdeck app on the App Store has been updated and works quite well now, it's only crashed a couple of times in a week instead of several times a day. It supports Mojave dark mode as well as notifications, it's missing a GIF picker and the UI for threading, although threads can still be done the old fashioned way. Might be worth a try but I still miss the old twitter app, I'd have loved to see that updated as well.